I’m excited to try this recipe to satisfy my desire for **crunch**. Making your own gluten-free cracks is far cheaper and just as tasty as store bought! 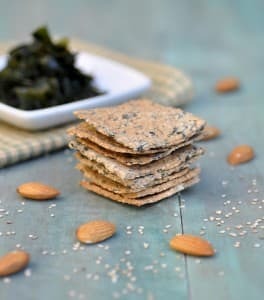 The addition of seaweed in this gem of a recipe gives really potent nourishment to an otherwise run-o-the-mill recipe. The question is…can it replace my potent, yet expensive adoration of Skinny Crisps?!? calcium,Â and magnesium. Since much of our topsoil is sitting at the bottom of the ocean from generations of erosion, sea veggies reap the extra minerals and nutrients that have been whittled away from its land-loving cousins. This cracker is an excellent way to introduce such foods to young children, without having them balk at the creepy stands of weirdness served at a Japanese restaurant. ENJOY! Â Combine flour, almond meal salt and dried seaweed in a food processor. Pulse until seaweed is finely chopped. Transfer to bowl. Stir in sesame seeds. Add water and knead until well combined. Cover the bowl and let sit for 10 minutes or so. Between two sheets of parchment paper, roll out the dough as thin and even as possible. Remove top baking sheet. If the dough appears to tear apart, put the dough with both parchment papers in the freezer for a few minutes. Afterwards, it will be easier to tear of the top sheet. With a knife or cookie cutter, cut the dough into desired shapes. Poke each cracker with a fork to prevent puffing. Transfer onto baking sheet (with bottom parchment paper). Alternatively, use the fork to thoroughly pierce edges in the dough so that your crackers will break apart easily once baked. Bake for 20 to 30 minutes or until edges turn golden brown. Remove from the oven and let cool. Break crackers at pre-cut edges, if needed. Serve immediately or store for future use. Thanks to fellow Health Coach Anja at Anja’s Food for Thought for this recipe!